Podcast statistics can be one of two things - incredibly intimidating or incredibly intoxicating. Which is it for you? 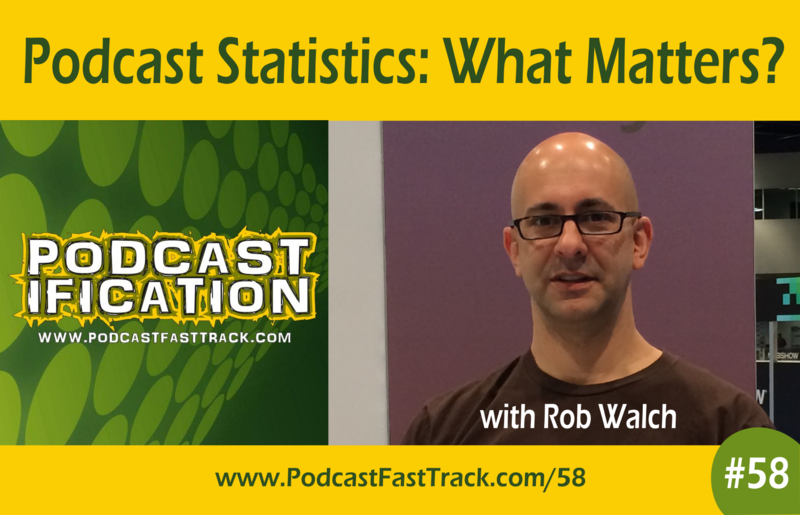 Since there’s so much ignorance and plain old misinformation out there about stats for your podcast I thought I’d invite Rob Walch, V.P. of Podcaster Relations at Libsyn to be on the podcast to tell us the TRUTH about stats. In this conversation we talk about download numbers, what they mean and where they come from, how they impact your iTunes ranking, whether New and Noteworthy is impacted by downloads, myths about podcast statistics, deep level stats and how to use them, Twitter bombing, and more. As always, it’s an entertaining conversation with Rob. You only have to listen to the beginning teaser to figure that one out! There are addictions of all kinds - and podcast statistics can be one of those. On this episode Rob tells us the kind of responses he gets from people when the Libsyn stats system is in maintenance mode for a few hours, why he thinks it’s unhealthy and unproductive for you to check your stats more than once a week, and how you can do that weekly checkup most effectively. It’s worth listening to whether you're the addict or apathetic. I guarantee you’ll learn something. [12:20] How do you REALLY get into the iTunes New and Noteworthy listing? And does it matter? There are tons of theories out there about how you can get your show into the iTunes New and Noteworthy section. But very few of them even hint at the REAL way your show can get into N&N. And it doesn’t really have to do with your podcast stats. Honest. Rob Walch speaks to the issue on this episode and clarifies the kind of “bump” to your downloads you might see if you do happen to get into N&N, and why it’s not what you really need to be focused on. [21:04] Common myths about podcast statistics - and what the truth is. [23:55] Geography, traffic sources, technology: Do those stats matter for your podcast? Libsyn and most other podcast media hosts are going to provide some pretty details statistics for your show. But do you know how to use them? There is a ton of insight in your stats dashboard and on this episode Rob shares how to interpret them and gives some practical examples of how to use them to make more money and understand exactly where you need to improve to gain more listeners. [39:58] What IS twitter bombing and why does it mess up your stats?